"Provide our Nation’s specialized airpower, capable across the spectrum of conflict … Any Place, Any Time, Anywhere"
"Any place. Any time. Anywhere"
AFSOC has about 15,000 active-duty, Air Force Reserve, Air National Guard and civilian personnel. The commander of AFSOC is Lieutenant General Marshall "Brad" Webb. Major General Eugene Haase is Vice Commander, and Chief Master Sergeant Matthew Caruso is the Command Chief Master Sergeant, Air Force Special Operations Command. The command's SOF units are composed of highly trained, rapidly deployable airmen who are equipped with specialized aircraft. These forces conduct global special operations missions ranging from precision application of firepower, to infiltration, aviation foreign internal defense, exfiltration, resupply and aerial refueling of SOF operational elements. In addition to the pilots, combat systems officers, and enlisted aircrew who fly AFSOC's aircraft, there is a highly experienced support force of maintenance officers and enlisted aircraft maintenance personnel who maintain these complex aircraft and their support systems, a cadre of premier intelligence officers and enlisted intelligence specialists well versed in special operations, as well as logisticians, security forces and numerous other support officers and personnel. Another aspect of AFSOC is Special Tactics, the U.S. Air Force's special operations ground force. 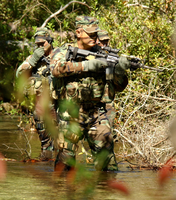 Similar in ability and employment to Marine Special Operations Command (MARSOC), U.S. Army Special Forces and U.S. Navy SEALs, Air Force Special Tactics personnel are typically the first to enter combat and often find themselves deep behind enemy lines in demanding, austere conditions, usually with little or no support. The command's Special Tactics Squadrons are led by Special Tactics Officers (STOs). Special Tactics Squadrons combine Combat Controllers, Tactical Air Control Party (TACP), Special Operations Weather Technicians, Pararescuemen (PJs) and Combat Rescue Officers (CROs) to form versatile SOF teams. AFSOC's unique capabilities include airborne radio and television broadcast for psychological operations, as well as combat aviation advisors to provide other governments military expertise for their internal development. Due to the rigors of the career field, Special Tactics' year-long training is one of the most demanding in the military, with attrition rates between 80 and 90 percent. In an attempt to reduce the high attrition, Special Tactics is very selective when choosing their officers. Special Tactics Officers (STO) undergo a highly competitive process to gain entry into the Special Tactics career field, ensuring only the most promising and capable leaders are selected. STO leadership and role modeling during the difficult training reduces the attrition rate for enlisted trainees. STO selection is a two-phase process. Beginning with Phase One, a board of veteran STOs reviews application packages consisting of letters of recommendation, fitness test scores, and narratives written by the applicants describing their career aspirations and reasons for applying. Based on Phase One performance, about eight to 10 applicants are invited to the next phase. Phase Two is a weeklong battery of evaluations, ranging from physical fitness and leadership to emotional intelligence and personality indicators. At the end of Phase Two, typically two to four applicants are selected to begin the year-plus Special Tactics training pipeline. In December 1982, the Air Force transferred responsibility for Air Force special operations from Tactical Air Command (TAC) to Military Airlift Command (MAC). Consequently, in March 1983, MAC activated Twenty-Third Air Force (23 AF) at Scott Air Force Base, Illinois. 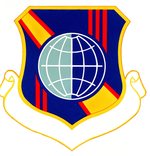 This new numbered air force's responsibilities included worldwide missions of special operations, combat rescue, weather reconnaissance and aerial sampling, security support for intercontinental ballistic missile sites, training of USAF helicopter and HC-130 crewmen, pararescue training, and medical evacuation. In October 1983, 23 AF helped rescue Americans from the island nation of Grenada. 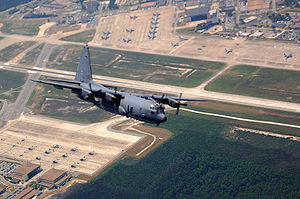 During the seven-day operation, centered at Point Salines Airport, 23 AF furnished MC-130s, AC-130s, aircrews, maintenance, and support personnel. 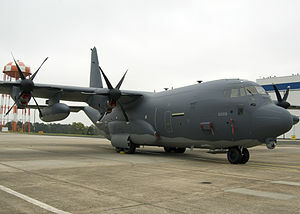 An EC-130 from the 193rd Special Operations Wing of the Air National Guard (ANG) also played a psy-war role. 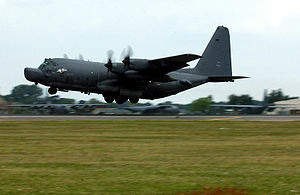 Lieutenant Colonel (later Major General) James L. Hobson, Jr., an MC-130 pilot and commander of the 8th Special Operations Squadron, was later awarded the Mackay Trophy for his actions in leading the air drop on the Point Salines Airport. In May 1986, the Goldwater-Nichols Department of Defense Reorganization Act led to the formation of the United States Special Operations Command. Senators William Cohen and Sam Nunn introduced the Senate bill, and the following month Congressman Dan Daniel introduced a like measure in the House of Representatives. The key provisions of the legislation formed the basis to amend the 1986 Defense Authorizations Bill. This bill, signed into law in October 1986, in part directed the formation of a unified command responsible for special operations. In April 1987, the DoD established the United States Special Operations Command (USSOCOM) at MacDill Air Force Base, Florida, and Army GEN James J. Lindsay assumed command. Four months later, 23 AF moved its headquarters from Scott AFB to Hurlburt Field, Florida. In August 1989, Gen Duane H. Cassidy, USAF, CINCMAC, divested 23 AF of its non-special operations units, e.g., search and rescue, weather reconnaissance, etc. Thus, 23 AF served a dual role: still reporting to MAC, but also functioning as the air component to USSOCOM. From late December 1989 to early January 1990, 23 AF participated in the invasion of the Republic of Panama during Operation Just Cause. Special operations aircraft included both active duty AC-130H and Air Force Reserve AC-130A Spectre gunships, EC-130 Volant Solo psychological operations aircraft from the Air National Guard, HC-130P/N Combat Shadow tankers, MC-130E Combat Talons, and MH-53J Pave Low and MH-60G Pave Hawk helicopters. Special tactics Combat Controllers and Pararescuemen provided important support to combat units. Spectre gunship crews of the 1 SOW earned the Mackay Trophy and Tunner Award for their efforts, with an Air Force Reserve AC-130A Spectre crew from the 919th Special Operations Group (919 SOG) earning the President's Award. An active duty 1st SOW MC-130 Combat Talon crew ferried the captured Panamanian President, Manuel Noriega, to prison in the United States. Likewise, the efforts of the 1 SOW maintenance people earned them the Daedalian Award. On 22 May 1990, General Larry D. Welch, USAF, the Chief of Staff of the Air Force, redesignated Twenty-Third Air Force as Air Force Special Operations Command (AFSOC). This new major command consisted of three wings: the 1st, 39th and 353rd Special Operations Wings as well as the 1720th Special Tactics Group (1720 STG), the U.S. Air Force Special Operations School, and the Special Missions Operational Test and Evaluation Center. Currently, after major redesignations and reorganizations, AFSOC direct reporting units include the 16th Special Operations Wing, the 352nd Special Operations Group, the 353rd Special Operations Group, the 720th Special Tactics Group (720 STG), the USAF Special Operations School and the 18th Flight Test Squadron (18 FLTS). 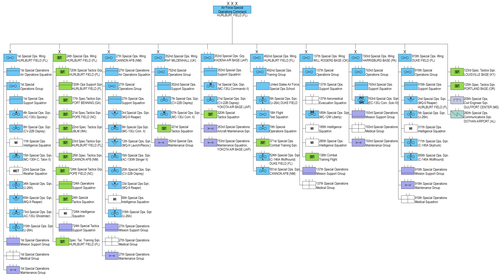 During the early 1990s a major reorganization occurred within AFSOC. The 1720 STG became the 720 STG in March 1992; the transfer of ownership of Hurlburt Field from Air Mobility Command (AMC, and formerly MAC) to AFSOC in October 1992, followed by the merger of the 834th Air Base Wing (834 ABW) into the 1 SOW, which assumed host unit responsibilities. A year later the 1 SOW became the 16 SOW in a move to preserve Air Force heritage. Meanwhile, the Special Missions Operational Test and Evaluation Center (SMOTEC), which explored heavy lift frontiers in special operations capabilities, while pursuing better equipment and tactics development, was also reorganized. In April 1994, the Air Force, in an effort to standardize these types of organizations, redesignated SMOTEC as the 18th Flight Test Squadron (18 FLTS). From early August 1990 to late February 1991, AFSOC participated in Operation Desert Shield and Operation Desert Storm, the protection of Saudi Arabia and liberation of Kuwait. Special tactics personnel operated throughout the theater on multiple combat control and combat rescue missions. 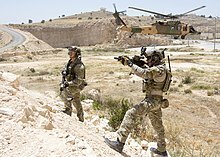 Special operations forces performed direct action missions, combat search and rescue, infiltration, exfiltration, air base ground defense, air interdiction, special reconnaissance, close air support, psychological operations, and helicopter air refuelings. 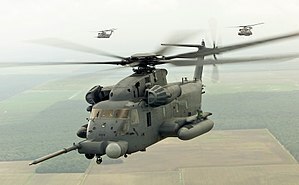 Pave Low crews led the helicopter assault on radars to blind Iraq at the onset of hostilities, and they also accomplished the deepest rescue for which they received the Mackay Trophy. MC-130E/H Combat Talons dropped the BLU-82, the largest conventional bombs of the war and, along with MC-130P Combat Shadows, dropped the most psychological warfare leaflets, while AC-130A and AC-130H Spectre gunships provided valuable fire support and armed reconnaissance. However, the AC-130 community also suffered the single greatest combat loss of coalition air forces with the shoot down of an AC-130H, call sign Spirit 03, by an Iraqi SA-7 Grail surface-to-air missile. All fourteen crew members aboard Spirit 03 were killed. In December 1992, AFSOC special tactics and intelligence personnel supported Operation Restore Hope in Somalia. In late 1994, AFSOC units spearheaded Operation Uphold Democracy in Haiti, and in 1995 Operation Deliberate Force in the Balkans. The terrorist attacks on the World Trade Center in New York City, and the Pentagon, Washington D.C., on 11 September 2001 pushed the United States special operations forces to the forefront of the war against terrorism. By the end of September 2001, AFSOC deployed forces to southwest Asia for Operation Enduring Freedom - Afghanistan to help destroy the al Qaeda terrorist organization and remove the Taliban regime in Afghanistan. AFSOC airpower delivered special tactics forces to the battle ground and they in turn focused U.S. airpower and allowed Afghanistan's Northern Alliance ground forces to dispatch the Taliban and al Qaeda from Afghanistan. AFSOC personnel also deployed to the Philippines to help aid that country's efforts against terrorism. US Air Force Special Operations had a long-term presence in the Philippines during Operation Enduring Freedom – Philippines. In March 2003, AFSOC again deployed forces to southwest Asia this time in support of what would become Operation Iraqi Freedom – the removal of Saddam Hussein and his Baathist government. The command's personnel and aircraft teamed with SOF and conventional forces to quickly bring down Saddam Hussein's government by May 2003. AFSOC forces continued to conduct operations in support of the new Iraqi government against insurgents and terrorists. AFSOC has had eleven commanders since its inception in 1990. Operations supported by Air Force Special Operations Forces since the Vietnam War. ^ "Air Force Special Operations Command (USAF)". af.mil. Archived from the original on 22 October 2017. Retrieved 4 May 2018. ^ "AFSOC "About Us"". afsoc.af.mil. Archived from the original on 22 October 2017. Retrieved 11 January 2018. ^ "Air Commandos". af.mil. Archived from the original on 22 October 2017. Retrieved 4 May 2018. ^ "United States Air Force". m.facebook.com. Archived from the original on 4 May 2018. Retrieved 4 May 2018. ^ a b c Bailey, Carl E. (9 November 2010). "Factsheet Air Force Special Operations Command (USAF)". Air Force Historical Research Agency. Archived from the original on 22 October 2017. Retrieved 30 October 2017. ^ "Air Force Special Operations Command > About Us > AFSOC Senior Leaders". www.afsoc.af.mil. Archived from the original on 22 October 2017. Retrieved 4 May 2018. ^ Department of Defense. Department of the Navy. Naval Imaging Command. 1988-ca. 1993 (Predecessor); Department of Defense. Defense Audiovisual Agency (Predecessor); Department of Defense. American Forces Information Service. Defense Visual Information Center. 1994- (12 May 1983). "Approved insignia for: 23rd Air Force". Archived from the original on 7 November 2017. Retrieved 4 May 2018 – via US National Archives Research Catalog. ^ "The Carpetbagger Photographic Archives". Archived from the original on 7 March 2015. ^ ZenosWarbirds (29 May 2013). "Operation Carpetbagger: B-24s drop agents and supplies into occupied Europe in WW2". Archived from the original on 27 January 2016 – via YouTube. ^ Haas, Michael E., "Apollo’s Warriors: US Air Force Special Operations during the Cold War", Air University Press, Maxwell AFB, Alabama, 1997, page 36. ^ "Topic: A-26A/B-26K Counter Invader Farm Gate Program - Bien Hoa AB Association". Archived from the original on 8 March 2016. ^ "Nakhon Phanom During The Secret War 1962-1975". Archived from the original on 23 February 2011. ^ "The Air Commando Association - Air Commando and Special Operations Combat". Archived from the original on 3 October 2015. ^ a b "Air Force Special Operations Command Brief History > Air Force Special Operations Command > Display". Archived from the original on 8 March 2016. ^ 23rd AF deactivates Archived 15 May 2013 at the Wayback Machine. Afsoc.af.mil. Retrieved on 2013-07-21. ^ AFSOC stands up Air Warfare Center Archived 17 February 2013 at the Wayback Machine. Afsoc.af.mil. Retrieved on 2013-07-21. ^ "1st SOW units". Hurlburt Field Public Affairs. 4 March 2015. Retrieved 25 May 2018. ^ "24th SOW units". 24th Special Operations Wing Public Affairs. 20 February 2015. Retrieved 25 May 2018. ^ "Air Force Special Operations Command > Units > Air Force Special Operations Air Warfare Center". Archived from the original on 4 March 2016. Retrieved 7 March 2016. ^ a b c "Air Force Special Operations Command > Home". Archived from the original on 20 January 2015. ^ "MAJOR GENERAL EUGENE HAASE > U.S. Air Force > Biography Display". Archived from the original on 12 March 2016. ^ "CHIEF MASTER SERGEANT MATTHEW M CARUSO > Air Force Special Operations Command > Display". Archived from the original on 12 March 2016. ^ USAF Special Operations Command Archived 2 February 2007 at the Wayback Machine Official Site. ^ "6th Special Operations Squadron - Defense Media Network". Archived from the original on 4 March 2016. ^ "MC-130J Commando II > U.S. Air Force > Fact Sheet Display". Archived from the original on 4 March 2016. 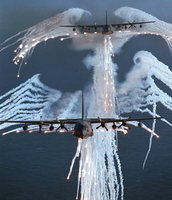 ^ "AC-130J Ghostrider > U.S. Air Force > Fact Sheet Display". Archived from the original on 8 March 2016. ^ "MAJOR GENERAL JAMES L. HOBSON JR. > U.S. Air Force > Biography Display". Archived from the original on 8 March 2016. ^ Pike, John. 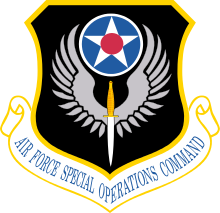 "Air Force Special Operations Command". Archived from the original on 2 May 2016. ^ Pike, John. "Hurlburt Field". Archived from the original on 3 March 2016. ^ Pike, John. "18th Flight Test Squadron [18th FLTS]". Archived from the original on 11 September 2015. ^ "25th Anniversary of Desert Storm". Archived from the original on 9 March 2016. ^ "In Memory Of "Spirit 03" Jan 31, 1991". Archived from the original on 8 March 2016. ^ "In memory of Spirit 03". Archived from the original on 8 March 2016. Haas, Michael E. Apollo's Warriors: U.S. Air Force Special Operations During the Cold War. 2002, University Press of the Pacific, Honolulu. ISBN 9781410200099. Hebert, Adam J. "The Air Commandos". Air Force Magazine, March 2005 (vol. 88, no. 3). Wikimedia Commons has media related to Air Force Special Operations Command.